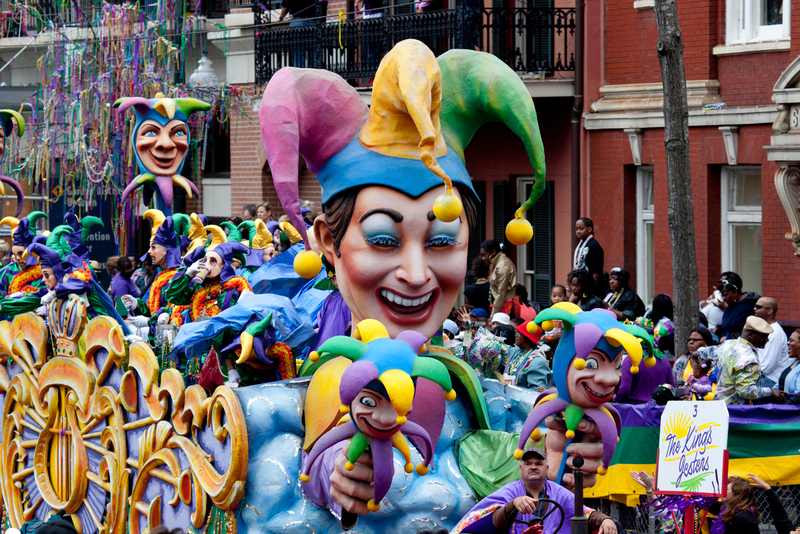 Mardi Gras 2016 is this Tuesday—laissez les bon temps rouler! This terrific post about Mardi Gras in the U.S. was written by Rebecca Sheehan, Ph.D., back in 2009. Dr. Sheehan is an associate professor of geography at Oklahoma State University. The French Quarter is the quintessential center of Mardi Gras in New Orleans and traditionally what people associate with the celebration. Here, debauchery is at its most extreme and anything goes. Locals work on costumes for months, and concerns of too much glitter, too many feathers and beads, too much naked skin never come to mind. But Mardi Gras is much more than this. Mardi Gras in New Orleans is (now) as diverse as the city is. Uptown parades are family-oriented, with cookouts on neutral grounds (the median the streetcar rolls along). Families set up ladders for children to stand on to better see and have a chance at catching throws. It is not uncommon to see tents, large areas taped off, couches, and other assorted furniture on the neutral grounds during Mardi Gras. 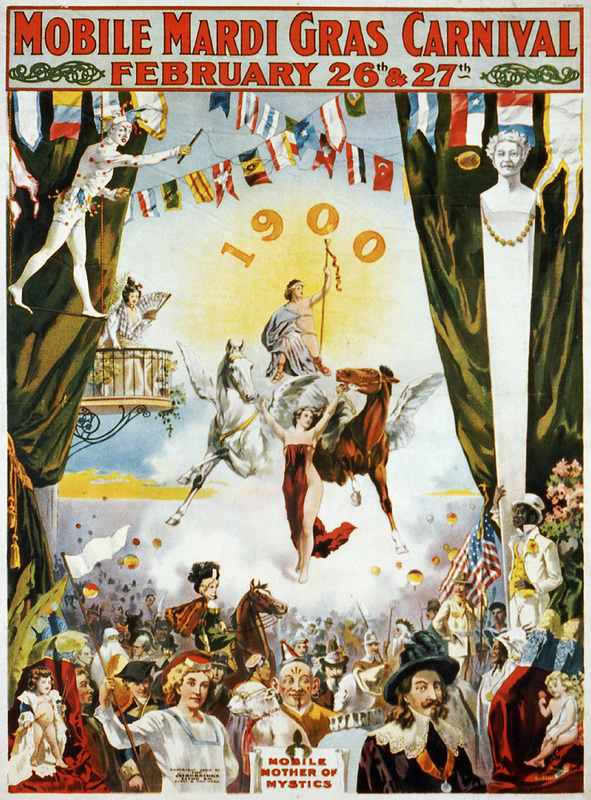 Mobile, Alabama’s Mardi Gras celebrations stretch back almost 200 years from this 1900 image. One of my close friends has lived in both Mobile, Alabama, and New Orleans, Louisiana—two cities that have always observed Mardi Gras and squabble over bragging rights concerning which stately southern city first celebrated the historically Catholic event. 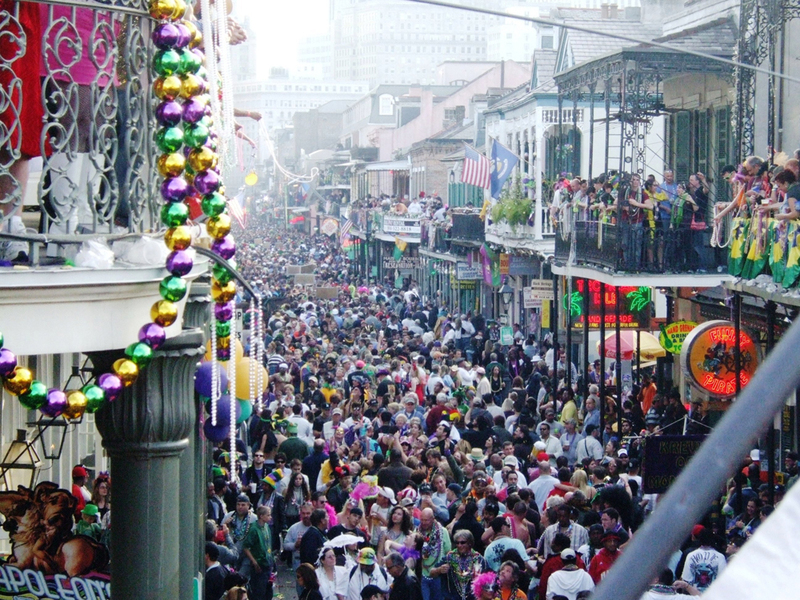 Mardi Gras began about 60 miles south of New Orleans at Point du Mardi Gras, or Mardi Gras Point, in 1699. Mobile’s first official celebration was in 1703. Since New Orleans was not “founded” until 1718, Mobilians consider the Point du Mardi Gras celebration in 1699 null and void! Krewes are organizations that are responsible for Mardi Gras or carnival parades. Krewe float riders (here, the Krewe of Rex) toss “throws” to the crowds; the most common throws are strings of plastic beads, doubloons, decorated plastic throw cups and small inexpensive toys. Learn more about New Orleans’ Mardi Gras krewes here. Mobile can also stake claim to initiating the parading “krewes,” helping their friends in New Orleans establish this tradition in 1857 with their first parading Krewe of Comus. Krewes are organizations that are responsible for Mardi Gras or carnival parades. Krewes developed as social and benevolent organizations. The history of Mardi Gras krewes in both cities includes white exclusionary practices against people of color. Though all people in Mobile participate in Mardi Gras festivities,there are two carnivals—one black, one white. Beginning in the early 1990s, however, all krewes in New Orleans were ordered by the courts to open their membership to all races and ethnicities. Today, some krewes are more integrated than others and a dominance of white-only male krewes continues. That said, several important, long-standing black Mardi Gras traditions thrive in New Orleans. The Krewe of Zulu, the first black krewe in the city, was founded in 1909. Though this krewe has been criticized for members donning blackface during parades, the tradition continues among its black, white, male, and female members. On Mardi Gras, the Krewe of Zulu, still predominantly black, parades through the traditionally white and upper-class streets of St. Charles Avenue and Canal Street— reconfiguring, if only temporarily, the social geography of the city. The Northside Skull and Bones Gang calls itself “the oldest Mardi Gras Black Indian Gang or Tribe in America.” The group was founded in 1819 in the Tremé, a primarily black-inhabited neighborhood adjacent to the French Quarter. They began to parade in the 1930s. Dressed in skeleton costumes, the Northside Skull and Bones Gang parade through the Tremé beginning at 6 a.m. to awaken everyone for the day’s festivities. They often wear papier-mâché skull heads and carry joints of raw meat. A good friend of mine’s son once paraded with the gang as their youngest member at 7 years old—an important part of preserving the tradition. Other krewes largely composed of minorities or less-powerful groups in New Orleans also temporarily disrupt the social landscape. Krewe du Jieux celebrates and plays on traditions of the Jewish community in the city. Instead of beads, Krewe du Jieux throws include gold-painted bagels. The Krewe of Muses, traditionally a female-only krewe, spoofs images and ideas of femininity, starting with a woman’s high heel shoe as its hallmark. Muses throws include strands of beads with small purses, compacts with “Muses” stamped on them, and “Muses” teddies. The Krewe of Barkus, a dog-only krewe, parades through the French Quarter (Quarterites do love their canines!). 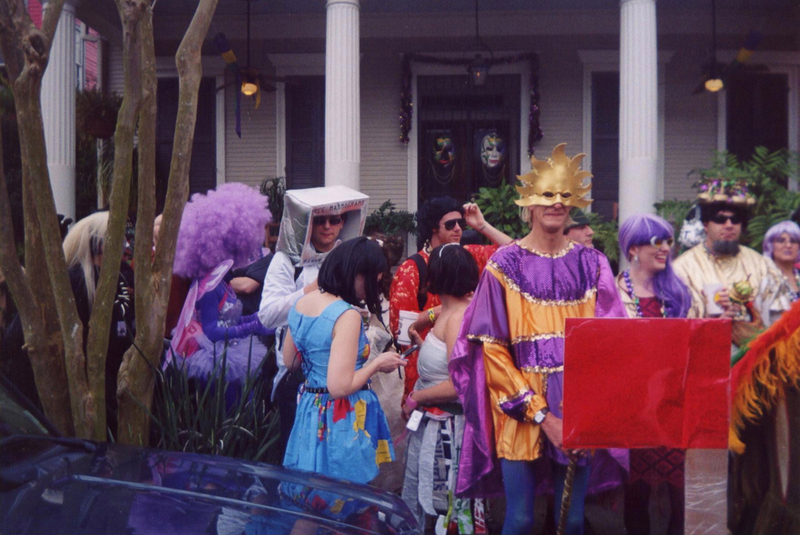 On Fat Tuesday (Mardi Gras) itself, small “unofficial” krewes form, seemingly haphazardly. These krewes—comprised of blacks, whites, women, men, young, old, poor, and rich—celebrate with libations, food, and costume contests as they parade, often with no set route, through the streets of New Orleans. The neighborhood Krewe of St. Anne celebrate Mardi Gras 2005. My favorite local neighborhood marching krewe, St. Anne, begins in the Bywater, a traditionally black neighborhood, and travels upriver through the Marigny, historically an immigrant-dense and less-well-off French Creole neighborhood, through the French Quarter. A virtual cornucopia of brightly colored mystical costumes, beating drums, tingling tambourines, and thundering brass make the experience one of the more magical moments in my New Orleans cadre of memories. Previous Previous post: Do Languages ‘Think’ Alike?